A member will visit this page in order to complete setting up their profile although it is optional. One may complete registration without completing “path 1 page 2” . On the top right hand side of the page there is a “sign out” link and a “skip” link. “Sign out” will link back to the start page, while “skip” will link to “Path 2, Page 1” or member’s home page (aka: “welcome aboard”). In this page , and the next a member can choose what his / her profile may include or reveal to other users. “my photos” will allow member to upload up to 10 photos which will be visible to all users. A member may choose to upload no photos at all, but instead use the “cartoon me” link (“pick one” button) which will open an image gallery with cartoons from which to choose. Before member makes his/her photo choices, there will be a generic silhouette populating the photo slot. Below there is an area where a member can enter a description of themselves as a professional. “About me, the professional” is optional and limited to 5000 characters. Below is an area where member may enter a description of themselves as a person. “about me, the person” is totally optional and limited to 5000 characters. SinglesFly is not a matching site. We will not create a list of personal or professional questions, designed to find anyone a match. That is left up to the members to do. SinglesFly will not make any claim or promise of finding anyone a match. The membership is free and the charge is per use. Members are encouraged to join dating sites which promise home-based matching services, while using SinglesFly for dating when they travel. Below, a member is given the option of entering their website and business email address. Being that SinglesFly can connect people who travel on business, visit business conventions and Trade events, it is entirely possible that a date, which did not result in a romantic connection, may prove to be the start of a lasting business relationship or a connection to other persons in the same trade which may bring future business. SinglesFly may try to affiliate itself with LinkedIn to accommodate the professional self-promotion which “LinkedIn” offers with the dating potential in our site. Many of LinkedIn’s members fly on business and may be able to connect with SinglesFly members ONLY from their professional discipline AND the same “50-50” range. (explained later). Below, still on the left half on PPS page 5 (my profile options) are two links relating to “my paper trail” (explained later). The “what ?” button will take you to the site’s tutorial area (path and page TBD), where a full explanation of the “my paper trail” feature will be available. “my paper trail” is an original new feature, never before used in online dating. It is the brainchild of Ben Adam and the intellectual property of ALL MAN CORP. since March 2010. The next button in the “my paper trail line is: “add docs now”, this button will link to Path 1, Page 2, Sub 1 (sub = sub page). Below, still on the left half on PPS page 5 (my profile options) are two links relating to “my pre-paid click stash” (explained later). The “what ?” button will take you to the site’s tutorial area (path and page TBD), where a full explanation of the “my pre-paid click stash” feature will be available. “my pre-paid click stash” is an original new feature, never before used in online dating. It is the brainchild of Ben Adam and the intellectual property of ALL MAN CORP. since March 2010. The next button in the “my pre-paid click stash” line is: “buy clicks now”, this button will link to Path 1, Page 2, Sub 2 (sub = sub page). 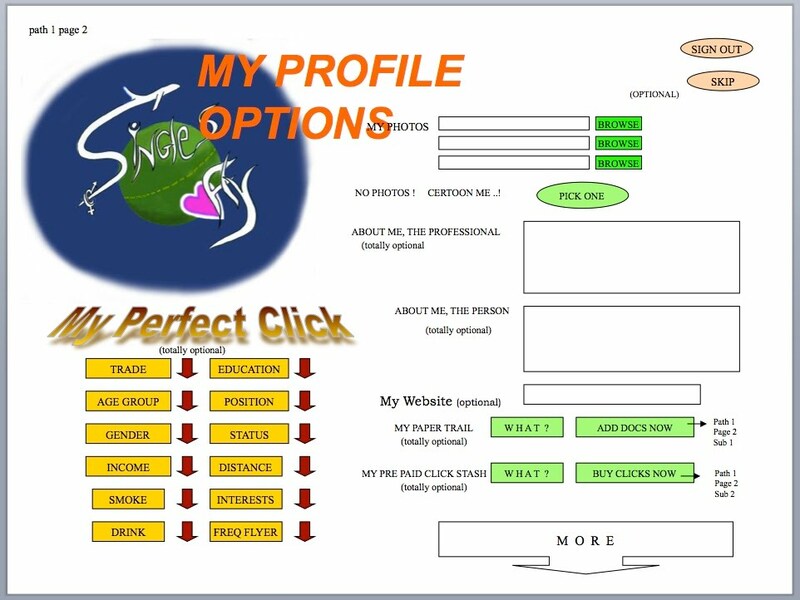 On the left half of PPS page 5 (my profile options), below the SinglesFly logo is an area where a member may choose to specify who he/she are looking for. This information will be visible to members and providing it is optional. This information can help other members, better understand what professional leanings and personal qualities one looks for. This information will not be used by SinglesFly to match the user with members, nor will it be used to “filter” or “exclude” members from being visible or entering one’s “50-50” group. The following drop-down menu buttons will be featured: trade , education , age-group , position , gender , status , income , distance , smoke , drink , interests , frequent flyer .